Happy Birthday America. What better excuse to be patriotic than by dropping the Benjamens on a gift for yourself in honor of our great country's birthday. Particularly when the great Italian fashion house Gucci is having a sale. Yes, that's right...you read it here. The top o' the line luxury line is parting with its beautiful bags, shoes and accessories. 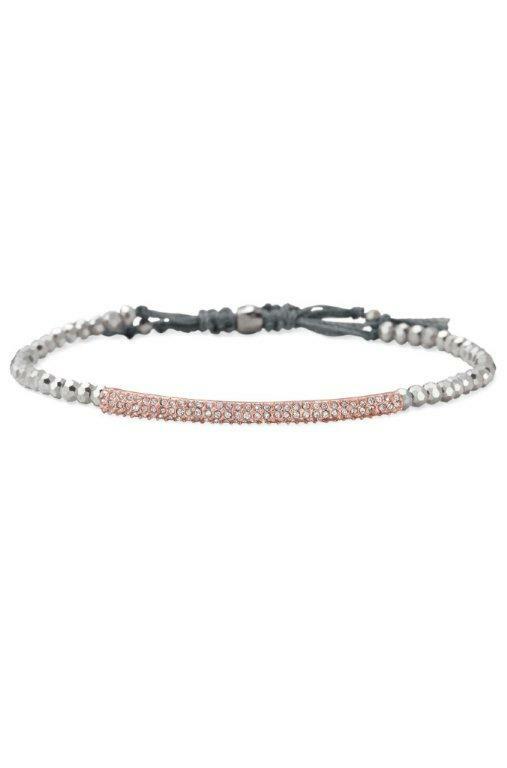 Visit http://www.gucci.com/us/category/u/sale for the specifics. If you live in the Los Angeles area, you have a chance to score some vintage Chanel. The LA-based vintage boutique What Goes Around Comes Around (located at 159 La Brea Ave., Los Angeles) is having its annual Chanel event. Not necessarily a major price break, but some beautiful bags, shoes, jewelery are pretty just to look at and muse about Chanel days gone by. Barneys New York http://www.barneys.com/Sale/sale,default,sc.html and Saks Fifth Avenue http://www.saksfifthavenue.com/search/SearchSale.jsp?bmUID=jpoFcPO&tre=salenav2 are having sales right now. However, I checked on the Saks Sale shoe selection and its pretty righteous with B Brian Atwood, Jimmy Choo, Manola Blahniks, Miu Miu among many others offered at a fraction of full price. 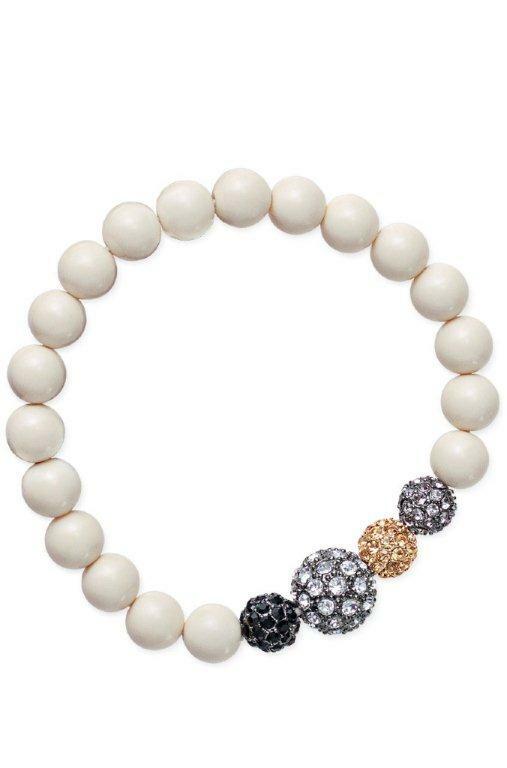 Lastly, Zara, the International fashion company, is having a huge sale in stores and on-line. 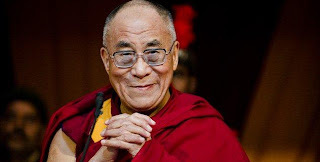 If you are up early this morning, check out the Dali Lama’s Live Webcast: “Be the Change” from Inverness, Scotland, on June 23, 2012, from 1:30 to 3pm (BST), 8:30 am (EST) and 5:30 am (PST). I grew up surrounded by religion; however, as an adult, I am very curious about the different religions and spiritualties from around the globe. His Holiness the 14th Dalai Lama – who’s mission to bring peace to the people of Tibet as well as the world – has always intrigued me. The Dalai Lama, Tenzin Gyatso, is both the head of state and the spiritual leader of Tibet. He was born on 6 July 1935, to a farming family, in a small hamlet located in Taktser, Amdo, northeastern Tibet. At the age of two, the child – who was named Lhamo Dhondup at that time – was recognized as the reincarnation of the 13th Dalai Lama, Thubten Gyatso. It has almost been a year since my husband and I bought our home. 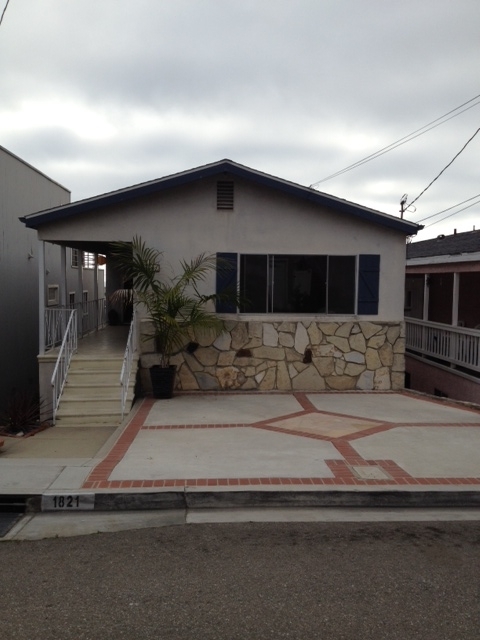 We started out of the gate strong with plans to renovate our Mid-Century Modern. Within six weeks of closing escrow, we had the hardwood floors in our entire house redone. The change was drastic; it was immediate; and our new floors are gorgeous. We also did some minor cosmetic changes such as ripping down the old window coverings and replacing them with new colorful drapes and decorative shades. My mom – who is renovating her home in New Mexico – is a big fan of HGTV and the DIY channel. She sent us a few links for shows that were looking for new homeowners, such as ourselves, to be a part of DIY projects reality shows. We actually submitted a video to be considered as contestants and, much to our surprise, we got the role; however, once we found out that it would be up to Jason and I to actually do the renovations, we passed on the opportunity. I think “Divorce Court” would have been in our future. Also, this show renovated living rooms and that could possibly be the only room in our house that doesn’t need to be changed. Not really being the DIY-types, our home renovating aspirations sort of fizzled out around Christmas. Other than purchasing some throw pillows, we haven’t done anything since the New Year. Our procrastination isn’t because we don’t want to make progress. I mean, if we had unlimited funds, I’m pretty sure we would move into a rental in order to blow out and renovate our kitchen; revamp our deck; and change our façade. These projects will all come in due time; however, right now, there are so many little projects that need to be done we don’t even know where to begin. When I personally start thinking about everything we want – um, need – to do around our house, my brain just sort of shuts down. It is almost like that scene from the Mel Brook’s movie “High Anxiety” where I am spinning out of control. So, I start to think about things I can control like what to cook for dinner and what I want to wear to my next girls’ dinner. However, hope and inspiration came to me last Friday when I found an article from the publication “CountryLiving” by Beth Ann Fennelly. The editorial profiles Emily and Michael Knotts who renovated their home on the cheap. There was even a reference to open cabinets on my favorite trash TV show, "True Blood." They actually referenced this article. I have to say – as a self-proclaimed non-DIY-er – this article absolutely encouraged me. In particular, the dining room table which they made for $11 is amazing. 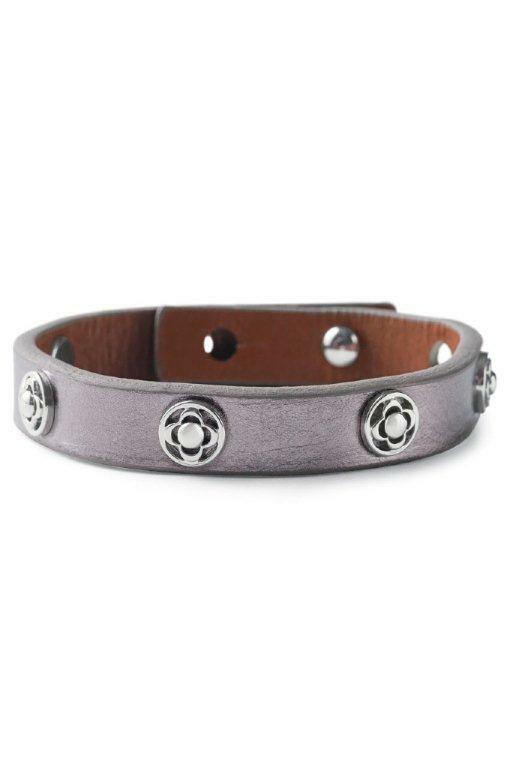 It is exactly what I have been looking for over the past year but unable to find in our price range. Since I don’t have any DIY experience – and I’m not that handy (really) – I could not actually build a dining room table, but I think Jason could. He is the artist in our family. However, part of the problem is finding the time to do all these projects. I can barely keep up with my blog let alone take the time to even just clean our garage. But both Jason and I agree that a change has got to come. We have decided to get serious about tackling these home improvement projects. Since summer is here and we spend most of our time out on our deck enjoying our ocean view, this is the first order of business. Jason is going to weather-proof and paint the deck, while I re-upholster our orbit lounger. (Yes, it is as cool as it sounds.) We plan to hit up some estate sales and look for some unique pieces to mix in with our existing patio furniture. It is time to get busy. When the deck is done, I’m setting my sights even higher and plan to renovate our guest bathroom. At 8’ by 8’, I think it is doable. Like anything else, revamping our home is going to be a process, it will be one step at a time. Sometimes, I like to avoid the chain make-up counters and just peruse the cosmetics at my local drugstore. This weekend, I had a golden moment and found myself taking home L'Oreal Paris' Infallible Eye Shadow in Eternal Sunshine. I love mixing metallic on my eyes right now and this cream to powder formula is waterproof, crease and fade resistant. It stays put all day and night. I just put a little golden bronze on my lids and gold on the lower lash lines to make my eyes pop and, the beauty of it all, it goes with any complexion. 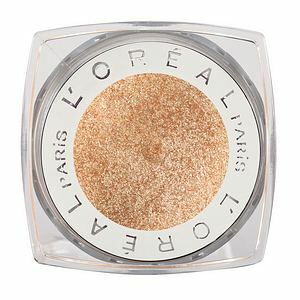 L'Oreal Paris Infallible Eye Shadow in Eternal Sunshine, $7.95 at drugstores. Five years later, Ricki was still realizing her fame with her first talk show – “Rickie Lake” – which premiered on Sept. 13, 1993. She became the darling of daytime television for more than a decade. Ricki’s show was a familiar presence in my home during my young adult years and I was a devoted fan. Her likable personality and down-to-earth interview style kept me going back for more over the years. I would even watch “Ricki Lake” when I was home on maternity leave when my son was born. In 2004, Ricki decided to end the show to spend time with her own family; however, she never really left the spotlight. Her documentary about home birth and midwifery, “The Business of Being Born,” was very successful and premiered at the Tribeca Film Festival. She also competed on the television show “Dancing with the Stars,” among many other projects. Now, almost 20 years later, Ricki Lake has come full circle and her new venture, “The Ricki Lake Show” is slated to premier in the fall of 2012. Recently, I was bestowed the honor of being a contributor to the online magazine for “The Ricki Lake Show.” I had the opportunity to share my views on women’s fashion and the dilemma of dressing too young for your age. Also, I was able to share some wisdom on how to avoid that fashion faux pas. I want to thank “Ricki” for the opportunity; now that’s a friend. With Father’s Day just around the corner, I enjoyed a little Mother’s Day in June. His sentiment made my heart sing, but I was a little bit caught off guard. Shane is a sweetheart but – with only a few months until he turns 8 – I’ve noticed just a little precociousness about him lately; None-the-less, he is such a good boy. I know that it is only a matter of time before he is too cool for his Momma. So you can imagine how happy I was that I had the absolute good fortune of getting a lot of Mommy and Shane time this past weekend. On Saturday, we spent the early part of the afternoon doing two of Shane’s favorite things: eating In and Out burgers and hanging out at his favorite park. Once our double doubles had been digested, we went straight to the Wilderness Park. Armed with a butterfly net and mesh bug container, we set off to catch us some bugs. However, our first order of business was to see if we could find our formal turtles Fasty and Slowy. about our turtles that we acquired in Chinatown a few years ago. Well, our tiny little reptiles were so healthy and grew to such great proportions that we released them into the wild a few months ago. Well, not necessarily the wild, but to the 11-acre Wilderness Park. Shane and I were so excited to find one of our turtles right there sunning itself on a rock on the shore of the pond. Out of the hundreds of turtles at the park, how did we know it was ours? Jason and Shane painted the shells of our turtles with nail polish, so we were able to locate one of our turtles, Slowy (the small turtle). 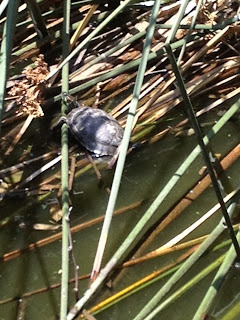 I suspect Fasty – the bigger turtle – was hiding in the reeds because he was also such a scaredy cat when he lived with us. It was so nice to see that Slowy was alive and sunning herself on a rock with another random turtle. She seemed right at home and it was much more humane than our 70 gallon tank which, believe it or not, was too small for the two of them. We spent another hour or so trying to catch butterflies. I figured they would be too fast for us to catch, but Shane was good. Thank goodness not too good or fast, because he didn't actually catch one. I kept telling him we didn’t want to wipe the butterflies’ magic dust off their wings because then they wouldn’t fly. Who did I think I was dealing with and did I really think he would refrain from trying to catch those beautiful insects? Uh, duh; that was the fun of it. But the good news is that our bug catcher came back home empty and all the bugs were safe – at least for another few weeks. After the park, we ran a quick errand and then we were home to get ready for Shane’s End of the Season Baseball Party. We spent the entire evening at our local park, celebrating Shane and his team’s Double A Championship win. It was an amazing night and Shane pretty much slept with his trophies. The next day, Shane had a flag football playoff game and my little man scored his first point of the season in a play that is similar to a field goal in regular football. Of course, mommy looked away for just a minute and missed it but, luckily, I’ve got the chance to see it again on the video replay. After football, we dusted off Shane’s jersey and I took him to his good buddy’s Video Game Truck birthday party. For three and half hours, Shane was entranced by Halo and Lego Star Wars. I had to practically drag him out of the party because we had dinner plans with my hubby Jason, sister- and brother-in-law. But, when we arrived at Kula Revolving Sushi Bar, Shane was once again fascinated. Despite the long wait due to its über-popularity, Kula has a conveyor belt that runs around the entire restaurant and you can pluck the sushi and other items off as they pass by your table. I was even impressed and it takes a lot to get me excited. Although Jason was with us for most of day on Sunday – with the exception of the party – it really felt that Shane and I had gotten some much needed quality time together. As I tucked him into bed that night, I couldn’t help but be astonished at how grown up he’s becoming: His legs are long and not as coltish as they had been; His hair is growing out and making him look a bit older; I had the pang in my chest that my baby is growing up. I resolved right then and there to make sure I take advantage and enjoy every second of our time together. Before I know it, he’s going to be too cool for me and shake off any hand-holding or Mommy-Son PDA. As I turned out the light I thought, good question! But I said we will just have to make every day of our lives just like summer vacation. 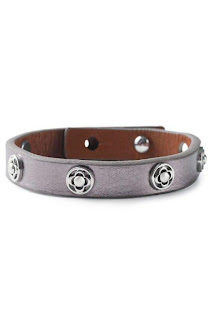 With the dog days of summer upon us, what better way to keep those fun in the sun memories with us all week long than under-the-sea-inspired jewelry. One my my favorite Los Angeles-area boutiques -- which also sells its wares online -- M. Fredric offers an array of hot summer accessories such as starfish, coral and shells. 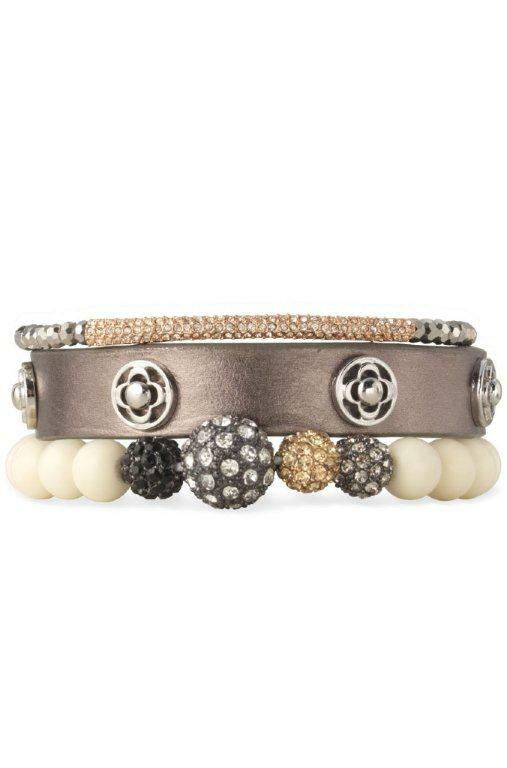 My favorite is the "Starfish Cuff" in gold or silver metal which retails for $32. I have serious issues with guilt. One time, I had a co-worker who asked me if I was Catholic. Not that there is anything wrong with Catholicism, it was just that I was constantly "feeling bad" about everything I did or didn't do at work. The co-worker -- who was Catholic -- said I always seemed like I needed to be in confessional. I know that my guilt stems from wanting to be perfect in every aspect of my life. I strive to be the best mom and wife -- even if it means putting some of my own wants on the back-burner; I am driven to be absolutely flawless at work; I desire to be there for all my family and friends all the time. I put pressure on myself to do it all and be there for everyone. I usually think about myself very last and, when I do, I feel "guilty" that I am actually doing something for me. That is why this attached Daily Om really hit home for me. It made me realize that I have to stop being so hard on myself and learn to just let some things go. I am human and I can only do what I can do, so releasing guilt is on my agenda. 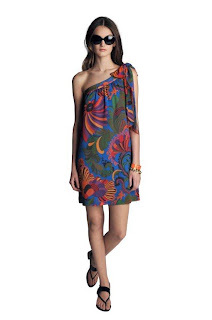 The first time I ever noticed a Trina Turk design was more than 10 years ago. One of my besties Courtney – who is by far my most fashionable friend – turned up at a wedding wearing the most beautiful Trina Turk dress. For years – every time I had a formal event – that dress popped into my mind. I wanted to emulate Courtney in that silhouette and print but was never able to find anything nearly as stunning. Then my mother-in-law Judith moved to the desert and I was able to live vicariously through her Trina Turk obsession. With Turk’s Palm Springs boutique mere blocks away from Judith’s casita, I was a frequent wing man but Turk’s high-end line was out of my grasp back then. Over the years, I’ve been lucky to score a few pieces – on sale – here and there; but I’ve never actually bucked up for a serious garment from any of her collections. Now I have my chance. 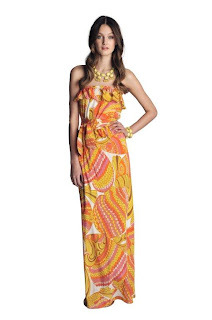 As of yesterday, the retail giant Banana Republic launched its Trina Turk Palm Springs Chic summer collection throughout 450 stores worldwide. The line – which totals 60 pieces – includes dresses, skirts, shorts, button downs, tunic tops and bathing suits. Turk’s moniker prints – with names such as “Deco Palms,” “Pisces,” and “Crazy Botanical” – have a vintage feel but certainly don’t give off a senior vibe – notorious for Palm Springs. 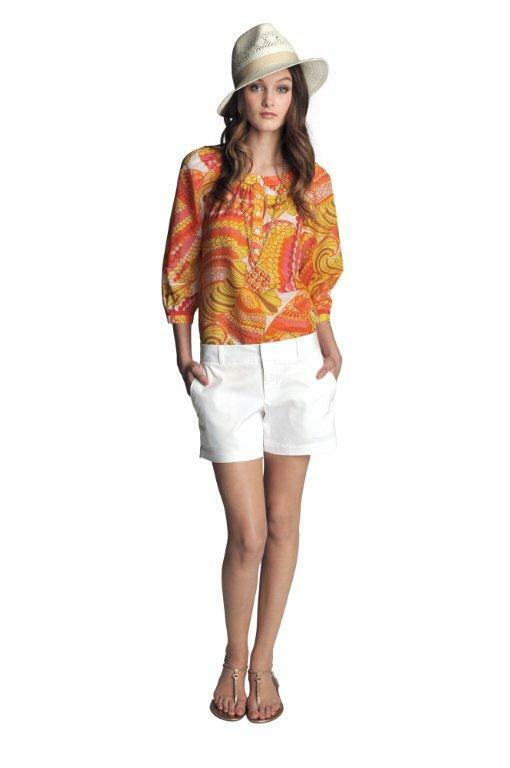 Infused with an affordable freshness, garments are priced from $34.50 to $150 about half the price of the high-end Trina Turk line. It is only fitting that the dazzling Turk, a native Californian, opened her first retail boutique in Palm Springs in 2002. Since that time, she has grown her realm to seven boutiques including Los Angeles, New York, Fashion Island in Newport Beach, Burlingame, Bal Harbour Shops in Miami, and the new Dallas’ Highland Park Village which opened in 2011. 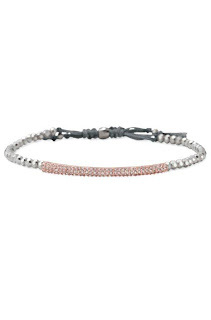 The company has also operates a seasonal store in the tony East Hamptons since 2009. After a decade, the collaboration with Banana Republic comes at a time when Turk is focusing on nurturing and growing her brand. Along with her former stylist husband – Jonathan Skow – Turk is preparing to launch a menswear collection designed by her hubby himself. She also recently started selling Trina Turk bedding at Neiman Marcus, Macy’s and Bed Bath & Beyond. In addition to expanding and renovating her flag ship store in Palm Springs, she has added a jewelry and stationary line to her ever growing empire. It is becoming a very Trina Turk world. The month of June always makes me giddy in anticipation for the fun days of summer. 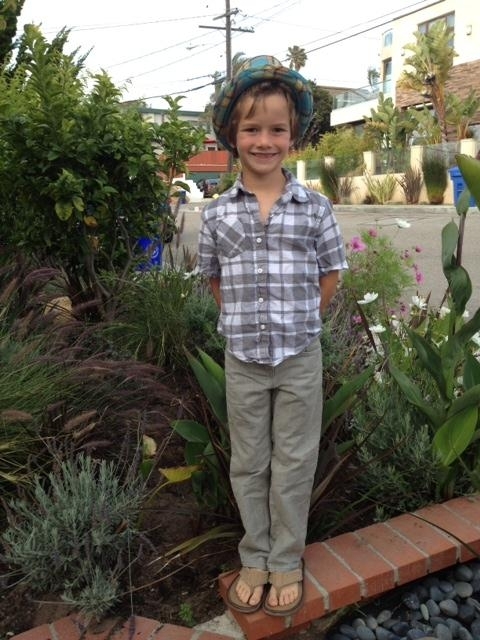 Even though today – I have a career – I live vicariously through my 7-year-old son who is super excited for his summer vacation to begin in exactly two weeks. It brings me back to the summers of my youth – in Jersey – of course. Memories of fried clams at Zelbes in Belmar, sweet treats at Day’s Ice Cream Parlor in the Grove, fun in the sun at the beach, and Action Park. Yes, for those of you who hail from the East Coast, I went there. Every year for my July birthday, my mom and I would make our annual pilgrimage – either solo, with family or my BFF Dina – to the amusement park and first American waterpark at the Vernon Valley/Great Gorge ski area. 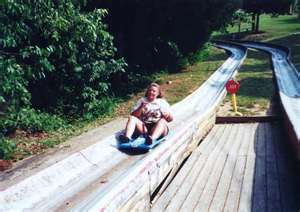 Action Park featured three separate attraction areas: The Alpine Slide, Motorworld and Waterworld. The park’s rides were incomparable and brought thrill-seekers from across the New York Tri-State area. According to Wikipedia, the park’s popularity went hand in hand with a reputation for poorly designed, unsafe rides; inattentive, underage employees; intoxicated, unprepared visitors; and the consequently poor safety record. “At least six people are known to have died as a result of mishaps on rides at the park. It was given nicknames such as ‘Traction Park,’ ‘Accident Park’ by doctors at nearby hospitals due to the number of severely injured park-goers they treated,” states Wikipedia. Despite its negative history, I can honestly say that on the days leading up to my visits to Action Park, I was so excited I could barely contain myself. 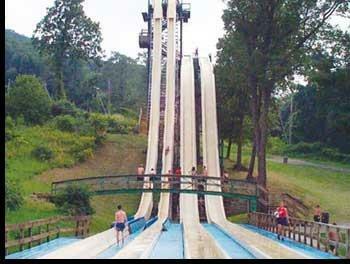 Our first trip to Action Park – which was only open Memorial through Labor days – was for my 8th birthday. Exactly the same age that my son will be this summer. By California law, my son must still ride in a booster car seat until he is 4’ 9”; at 4’ 2”, he still has a ways to go. But when I was his age, I was allowed to jump off a 23 foot high diving cliff, ride the treacherous Alpine Slide, and drive gasoline fueled go-karts while at Action Park. My mom, Dina and I would throw on our sneakers and, clad only in our bathing suits since we were also going on the water rides, would zip down the shoots. I was always petrified – as I should have been as there were no helmets here – and would go as slow as I possibly could. Inevitably, some jerk would come speeding down the track and crash into the back of my cart to show how annoyed he was with my cautiously slow speed. Not necessarily a big fan of the Alpine Slide, my favorite part of the park was definitely Waterworld and my preferred attraction was the Colorado River Ride. 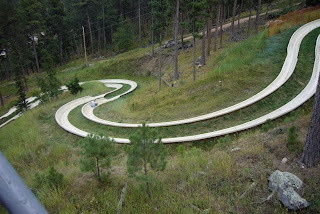 At the bottom of a hill, riders would be given a black inner tube and we would wind our way up the concrete path, through a shady wooded area, barefoot and dripping wet. 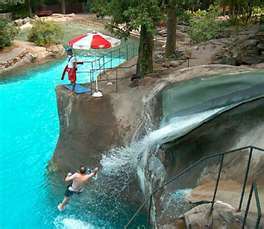 Once at the top, you would jump on your inner tube and start to float down the lazy river. Slowly at first until you started to gain speed as the river ran steep downhill. Sometimes, if you took a curve too fast, your tube would fly up on the embankment. If you weren’t holding on, the rider would fly out of the river – landing unceremoniously (and painfully) on wood chips, rocks and weeds. There was also a tunnel that was made of real rocks and, if you reached your hand out into the pitch darkness, you would find yourself bleeding and scratched on the other side. To me, the best part was the end and the big downhill portion that had jumps and bumps a foot high. If you were lucky and could stay on your inner tube, you would get air and slam down with a jolt. If you lost your raft, well, you would probably find yourself at the first aid station getting medical attention. I also loved the high speed water slides. They nearly vertical slopes for super-fast speeds. At the top, the slides were so steep that they had netting over top for the first several feet. I always remember my body elevating at this part of the ride and then slamming back down a few “feet” later. The lifeguards would yell at you to lay down and stay down. If you didn’t, there was room for serious error, like flying off the slide. Since these were the only water slides I had ever really been on in my life, I didn’t realize that getting a giant water enema and wedgie wasn’t actually normal. Gross but true, I mean, I was 8 you know. As I mentioned before, I loved that 23 foot plunge off the diving cliffs; surf hill in which you slide down a water slicked slope on mats that landed in puddles; and the wave pool – aka the “Grave Pool,” – until I had my coming to Jesus moment. The deadly wave pool was 100 feet wide and 250 feet long and could hold 500 to 1,000 people. Waves were simulated for 20 minute at a time with 10 minute breaks in between. And, the waves could get as high as 3 feet. My issue happened when I was mid-pool and the waves started. I didn’t realize that it wasn’t all one depth – it actually got deeper the farther in you went. In addition, the chlorinated water wasn’t buoyant like sea water, so I found it harder to stay afloat and had to swim more frantically. Despite being tired, I was able to make my way to the side of the pool – with about 500 poor souls who were trying not to drown – treading water in order to keep my head afloat until it was my turn to climb the ladder out. As you can tell, I survived to tell my story but others weren’t so lucky. · On July 8, 1980, a 19-year-old park employee was riding the Alpine Slide when his car jumped the track and his head hit a rock, killing him. · On July 24, 1982, a 15-year-old boy drowned in the Tidal Wave Pool. · A week later on Aug. 1, 1982, a 27-year-old man tipped his kayak on the Kayak Experience and was electrocuted when he stepped on a grate that was in contact with, or came too close to, a section of wiring for the underwater fans that was exposed. · In 1984, a fatal heart attack was suffered by one visitor who some believe was triggered by the shock of jumping into the cold water below the Tarzan Swing. · On Aug. 27, 1984 a 20-year-old died in the Tidal Wave Pool. · On July 19, 1987, an 18-year-old drowned in the Tidal Wave Pool. I was shocked to read that, due to all the deaths and the inability to get liability insurance, Action Park operated with no insurance policy for its last several years in operation, said Wikipedia. I seriously had no idea this seemingly idyllic amusement park was such a dangerous commodity and I continued to frequent the park up until I was in college in the early 90s. When I met my husband a few years later, I joked with him about all my scars that I had from this crazy water park that I would go to as a kid. I told him about the water slides, the high dives and I even mentioned the Alpine Slides. I said it was crazy but so much fun. Then, a few weeks ago, he emailed me a Yahoo! 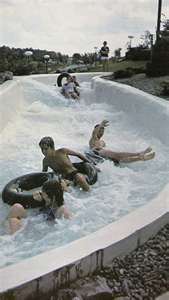 Article that was about a looping water slide at Action Park. The slide had a complete vertical loop like a roller coaster and test dummies had been dismembered. The actual ride was only open for a few days because riders had too suffered many back injuries and bloody noses. The article also went into detail about all the injuries and the few deaths that had occurred at the menacing park. 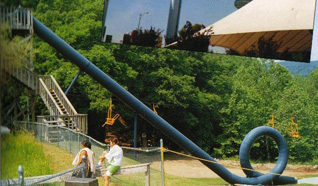 Looking back, Action Park didn’t seem all that scary. Yes, most of the rides were extreme and, in hind sight, dangerous; however, I just always accepted that this was how you had fun in the Motherland. It guess it's just a Jersey thing.